I just caught a new post over on WeirdoToys featuring a collaboration toy between Disney and Takara. I usually just pop over there once in a while to be amused by the ridiculous toys he finds, but this one grabbed me. 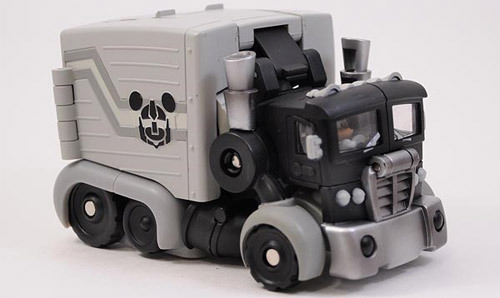 It’s an Optimus Prime meets Mickey Mouse mash-up that would look great on any geek’s shelf. Very cool, in my opinion, but a little outside my price range right now. (poo!) It was apparently released a few months ago, but I hadn’t seen or heard of it. Looking at eBay, I see that they are definitely available for purchase still . I have no idea how limited they are and from the comments left on the WeirdoToys post, there may be a Donald Duck / Bumblebee coming next. Tagged Disney, Mickey Mouse, Optimus Prime, Takara, Transformers. Bookmark the permalink. Hey! Thanks for the sharing the Weirdo Toy love. It’s great to find folks who enjoy these toys as much as I do. This Mickey really IS cool isn’t it?